Although this movie came out last year in the US, I saw it in a theater in China just over a week ago. The 23rd (!) 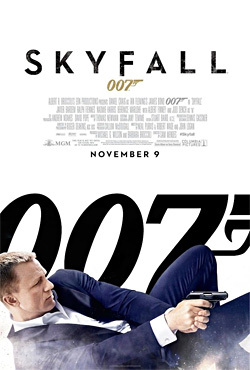 James Bond film and Daniel Craig’s third, Skyfall is probably the best Bond film in decades. In this iteration, Bond pursues an ex-agent (played by Javier Bardem) determined to murder Bond’s boss, the head of MI6. This is the first Bond movie directed by Sam Mendes (American Beauty), and the cinematography in this film is heads above the previous Bond film Quantum Solace. James Bond feels a little cliche to me – especially when the theme song plays – but this film is difficult to knock. Action scenes are stunning from the first moment, an intense motorcycle chase scene in Istanbul. The Bond series in general is moving in the direction of The Bourne Trilogy in it’s grit, which I think is a good thing. With that said, I think I still prefer Bourne as a franchise over Bond. There’s so much less baggage.